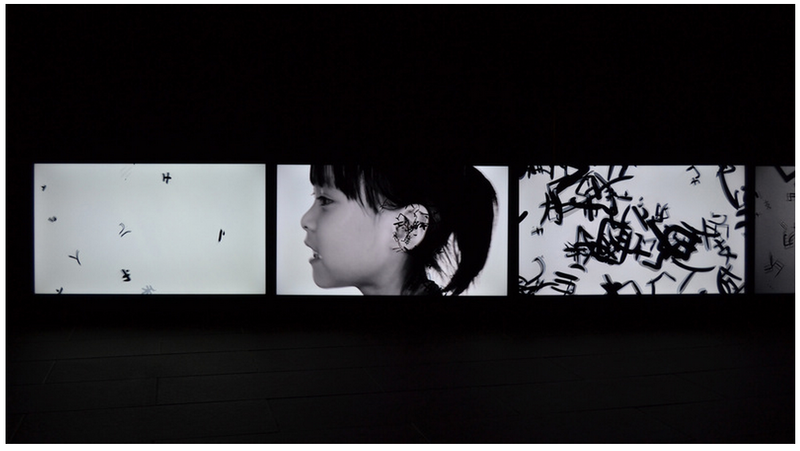 Hung Keung’s video instalation, Dao Gives Birth To One. Photo by Sarah Walters. In a totally blacked out room, a line of TVs hovers a few inches off the floor with ever increasing numbers of Chinese letters swarming around on them like trapped flies. The story, Hung Keung’s award winning digital work Dao Gives Birth To One, reveals itself from one end to the other like an old Chinese scroll. And it’s based on a passage from Daoism that reads: ‘Dao gives birth to one; one gives birth to two; two give birth to three; three give birth to 10,000 things’. What interested him most about the lines was not their religious message but the ambiguity within them and the way they underpin Chinese society thousands of years after they were written. “The main background to his interactive work is that I wanted to visualise our traditional Chinese thought,” Hung explains. “Dao is regarded as one of the key elements in creating the world and the way he created the universe is subject to many interpretations. The words ‘give birth’ mean many different things, and the western scholars simply translate it as ‘generate’ or ‘create’. From this single passage from Daoism, the work more widely explores how ancient and modern society interact and exist simultaneously. It visually explores the theme through use of traditional pictograms and modern simplified Chinese characters that dance with each other in the animated footage and by including video of the body parts on which all Chinese pictograms are based. Hung also explores the way Chinese people interact with art; in general, he explains. Chinese painters create works designed to make the audience feel like they are taking a journey around the painting using a technique called free distance – an emotional approach rather than one that employs proper perspective or photorealism. His modern take on that has been to create interactive work that beams the audience on to the screens via a series of hidden cameras designed to make them physically move along the line of TVs. But he also wants people to sit and stare and he has made a series of bespoke seats to encourage people to sit and experience it on the right level – seats which are just visible in the light from the screens. At Chinese Arts Centre, Thomas St, until September 1 (Tuesday-Saturday, 10am-5pm). Free.